Mynard, J. (2014). Striving for Diversity, Accessibility and Quality: Evaluating SiSAL Journal. Studies in Self-Access Learning Journal, 5(2), 178-199. After establishing a journal, it is important to evaluate its progress to ensure that the principles that underpin its existence continue to be a priority. In this article, the author reports on measures that were used to evaluate Studies in Self-Access Learning (SiSAL) Journal. The research was designed to investigate the three principles that the journal values: diversity, accessibility and quality. The results identified some successful factors such as accessibility and favourable perceptions of SiSAL Journal’s quality. However, the results also identified areas that could be improved to further increase diversity and to encourage submissions from more authors based in different locations. The purpose of this paper is to report on ongoing efforts to monitor the success of Studies in Self-Access Learning (SiSAL) Journal, an open-access, peer-reviewed journal established and published at Kanda University of International Studies (KUIS) in Japan. 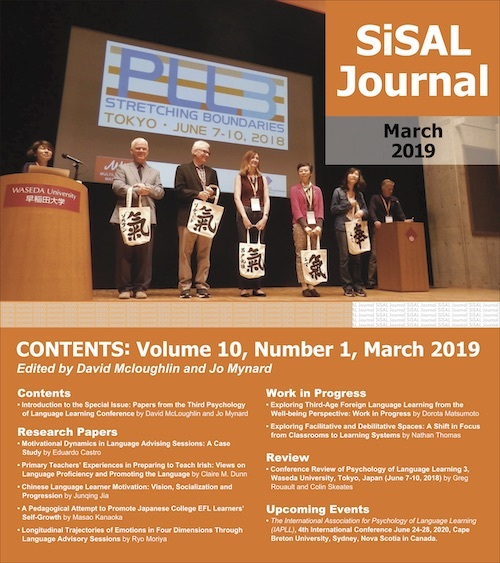 SiSAL Journal was formed in 2010 and has been the subject of two institutional projects funded by the Research Institute of Language Studies and Language Education (RILS&LE) at KUIS. The first RILS&LE project (2010-2012) investigated the editorial strategies of two peer review journals published at KUIS – SiSAL Journal and PeerSpectives. The authors also proposed an instrument designed to promote professional collaboration and diversity (Murphey, Mynard, & Shanley, 2012). The second project (2012-2014) evaluated the success of the same two peer review journals (Murphey & Mynard, 2014) and this research forms the basis of the present article. In this article, I will give a brief overview of SiSAL Journal before explaining some measures that are often applied to academic journals in order to evaluate a publication’s success. I will show how the research focussed on some of the factors related to the principles of the publication in an attempt to show how the editorial team currently views the success of the journal and what we might focus on in coming years in order to continue to improve it. SiSAL Journal was formed in 2010 to address a practical need. The journal was originally designed to be an in-house publication which provided publishing opportunities for colleagues working at KUIS along with a system to archive and share ongoing work. However, once the idea for establishing a journal was shared with colleagues in other institutions, it became clear that there was need for an international publication dedicated to self-access learning. Since its inception, SiSAL Journal has published quarterly issues containing a range of article types from full research papers, to summaries and book reviews. There have been a number of special issues, many of which have been guest-edited by international colleagues. There are various ways of measuring the success of a journal, some numerical and some descriptive. In terms of numerical measures, a commonly used tool is a citation index. A citation index shows how frequently articles from particular journals are cited. One example is the Social Sciences Citation Index (SSCI) which is an interdisciplinary citation index provided by Thomson Reuters. Closely related to this is the Impact Factor (IF) which is calculated by dividing the number of citations in a two-year period by the number of citable articles published the following year. The figure is usually published the subsequent year, so a journal needs to have existed for three to four years before the IF is available. This measure is particularly useful for scientific and scholarly journals when gauging the impact that a journal has within a field. However, there is the possibility that some editorial policies artificially affect the IF. Another drawback is that this measure is less applicable to journals which have a focus on practical applications as the articles may have a big impact on the field yet be of practical rather than scholarly benefit to its readers. Rejection rate is another commonly used measure and is the percentage of total submissions which are rejected in a year. Some journals boast a high rejection rate as this may indicate high standards. However, this measure might not be an accurate way to show quality as it is possible that a quality journal might have a low rejection rate as it only receives high quality submissions (Egbert, 2007). Timeliness and time to publication may be further quality indicators. If a journal publishes regularly and on time, this suggests that the editorial board are dedicated and efficient (Egbert, 2007). It also implies that there are enough submissions to make the publication viable. Availability and accessibility might also be meaningfully used as success indicators (Polonksy, Jones, & Kearsley, 1999) as the implication is that the journal will be read widely. However, this indicator might be very hard to evaluate if a journal is freely distributed. There are also non-numerical, descriptive measures that might be used to gauge success of a publication. One example is the inclusion in databases and indexes which not only increases access for readers, but is often evidence that the journal has passed the necessary evaluation procedure for inclusion. Another measure is the type of article that a journal publishes. A journal which publishes a high proportion of research papers may be an indication of high levels of scholarship, however, if the purpose of the journal is to influence practice, these kinds of articles may not necessarily be an indication of successfully reaching the target readers. Quality and originality of articles might be another way to evaluate the success of a journal, along with perceived reputation of the publisher, editor, editorial board and authors. These measures may be highly subjective. To summarise, there may be numerous ways to evaluate a publication but, as Egbert (2007) notes, “a single method, regardless of the number of components included, could not account for important differences among journals” (p. 157), so editorial boards might adopt a variety of different measures depending on the scope and purpose of the publication. For the evaluation of SiSAL Journal, we adopted the methods that were most relevant to our research questions and philosophy, but we may consider using some of the other methods in the future. The research design was constructed based on the desire to achieve three important values associated with the journal: diversity, accessibility and quality. Diversity can be defined as the way in which different perspectives are purposefully brought together in order to improve empathy and broaden our thinking (e.g., Lugones, 2003; Murphey, 2013; Ortega, 2005; 2011). Accessibility is ensuring that something is widely and freely available and this will have an impact on diversity. For example, diversity depends greatly on accessibility by both contributors and readers and online publishing has allowed both diversity and accessibility to blossom. It is probably true to say that all publications strive to ensure quality and this is attempted in SiSAL Journal by ensuring a rigorous review and editing process involving multiple readers. In addition, invitations to leaders in the field and special issues of publications also increase the quality of a journal. Angeles Arrien said, “I think the human spirit always wants to make a contribution. And I don’t think there are enough invitations” (cited in Briskin, Erickson, Ott, & Callanan, 2009, p. 156). The job of journal editors is to make those invitations wide and far in order to work towards the multiple aims of increasing diversity, accessibility and quality. For the purposes of this project, our success measurements were closely aligned to the values of the journal. As three of the main values of the publication are diversity, accessibility and quality, research questions for this project were formulated based on evaluating these values. Data were collected up until November 2013 when the results were submitted for publication in the RILSE&LE Journal (Murphey & Mynard, 2014). How diverse are the contributors in terms of location? How diverse are the readers of the journal in terms of location? How diverse are the reviewers and editorial team members in terms of location? These questions could be answered by examining the records related to submissions and reviewers and tabulated. How many views are the online articles receiving and from where? How many people subscribe to the journal or follow it on Facebook and where are they from? 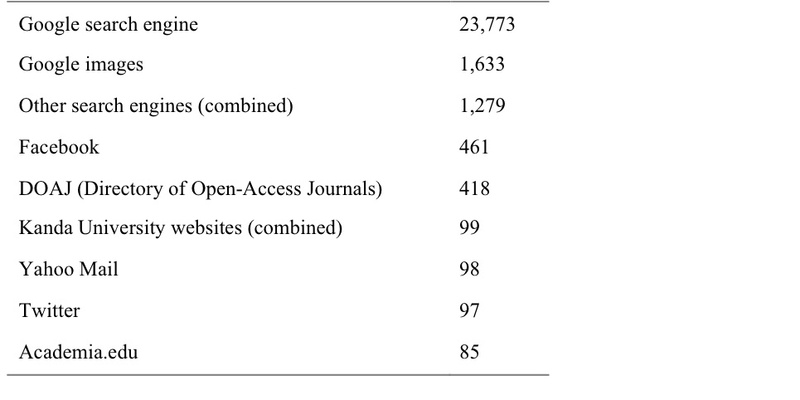 Which databases and links bring the most readers to the journal? These questions could be answered by accessing Facebook and the journal statistics automatically logged by the website provider (WordPress) and recording the data. How widely are the articles cited in other work? How do authors view the publication process? How do readers view the quality of the journal? A measurement of the first question could be attempted with some assistance from online sources, for example citation reports and universal factor evaluators. SiSAL Journal was evaluated by Universal Impact Factor and included in its Master List. However, although SiSAL Journal submitted an application to be included in the more widely recognised SSCI in 2012, it does not yet feature in its list. Some of the potential respondents may have been contacted in two or more of these ways over the two-week data collection period, but were limited to one response each. A total of 85 respondents began the survey, 71 (84%) of whom completed it. In order to analyse the data, the multiple choice responses were simply tallied and the open-ended responses were grouped thematically. Incomplete submissions were included in the data. Research Question 1 was concerned with how diverse the contributors are in terms of location. Since the first issue, SiSAL Journal has featured more diverse authors. For example, Issue 1 (June, 2010) contained contributions from authors based in just two locations: Japan and the UK. At the time of the data collection, the most recent issue (September, 2013) contained six articles by contributors based in five different countries: Jamaica, Japan, Mexico, New Zealand and Turkey. This snapshot report appears to indicate that contributors are based in more diverse locations. However, when we counted the number of authors (not the number of articles) based in each country over the 14 issues of SiSAL Journal published between June 2010 and September 2013, we noticed a disproportionately high number of contributors based in Japan. 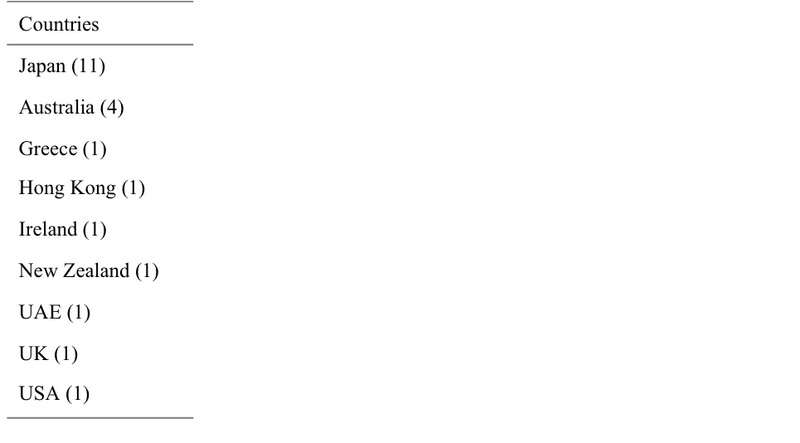 Table 1 shows a summary of the location of the authors. Perhaps this is not surprising given that the journal is published in Japan and almost all of the editorial team members are based there. Research Question 2 asked how diverse the readers of the journal was in terms of location. 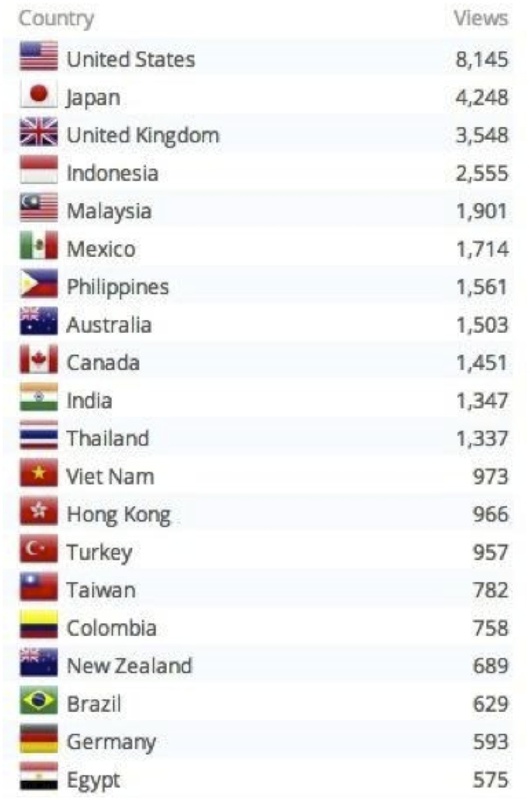 Readers of SiSAL Journal in a one-year period (from November 1 2012 to October 31 2013) were based in 169 different countries. 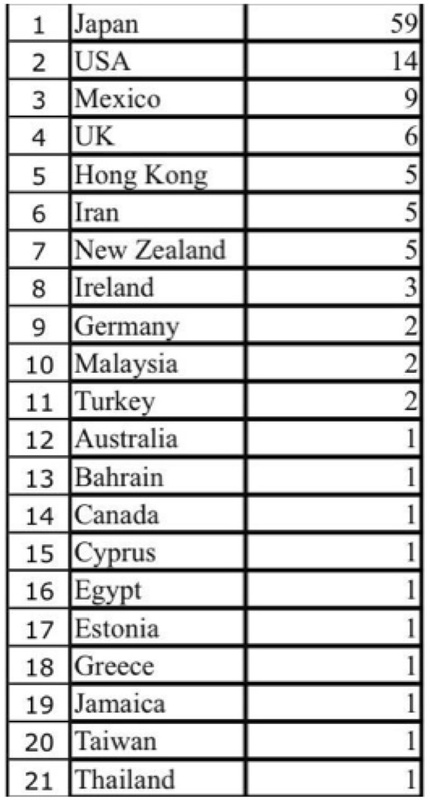 The 20 countries from which the journal was accessed most often during this time are listed in Figure 1. Research Question 3 was concerned with how diverse the reviewers and editorial team members of the journals were. The statistics showed a high number of members based in Japan (Table 2). We also noticed that there were more than twice as many males as females on the editorial and review boards (Table 3). In terms of the reviewers, they were based in 24 different locations which seems reasonably diverse. 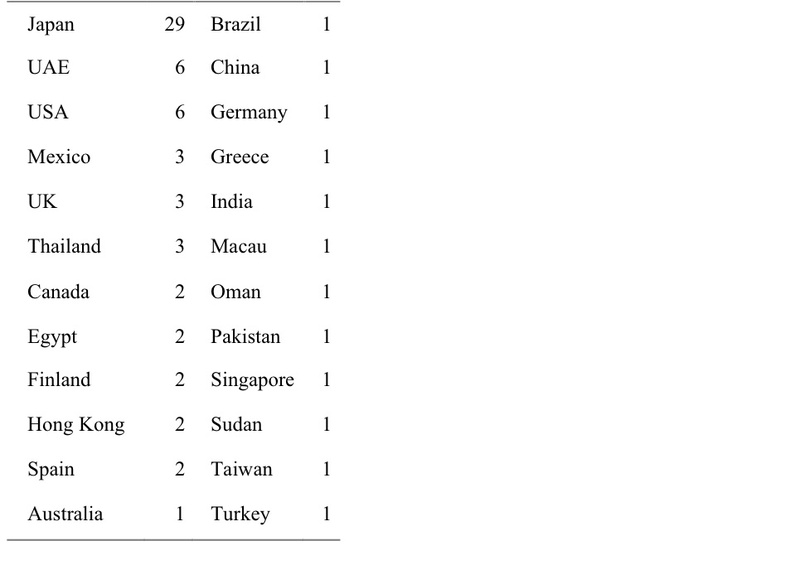 However, the majority (29 out of 73, which is 40%) were based in Japan (see Table 4). Other measures of diversity to research in the future could include whether the articles are single-authored or co-authored, whether the authors are male or female, whether the authors are based at our institution, in another institution in Japan, and whether the authors are students. For example, we know many of the reviewers may be located in Japan, but are not Japanese and thus location data alone can be misleading. Research Question 4 asked how many views the online articles are receiving. Total views from 1st March 2010 to 1st November 2013 for SiSAL Journal was 118,585. The statistics for a one-year period are shown in Table 5. In order to highlight the amount of access that individual contributions might get, a summary of the articles that received the most views in a one-year period and the number of views is shown in Table 6. The least frequently accessed articles are the editorials, some receiving just one or two views – or no views at all. Question 5 asked how many people subscribed to the online journals or followed them on Facebook. A summary is given in Table 7. Question 6 was concerned with which databases and links bring the most readers to the online journals. The statistics were calculated for the same one-year period as above for SiSAL Journal and are shown in Table 8. By way of comparison, Language Learning and Technology Journal, a highly respected and well-established, online, open-access journal had an impact factor of 1.38 in 2012. Questions 8 and 9 were investigated through the survey (Appendix A). Appendix B summarizes how the respondents answered the questions by indicating the number of respondents and, where relevant, the associated open-ended comments. Research Question 8 was concerned with how authors view the publication process and this was found to be generally positive. Out of the 33 respondents who had published in SiSAL Journal, 29 had had a good experience, three an acceptable experience and one a bad experience. The percentages are shown in Figure 2. 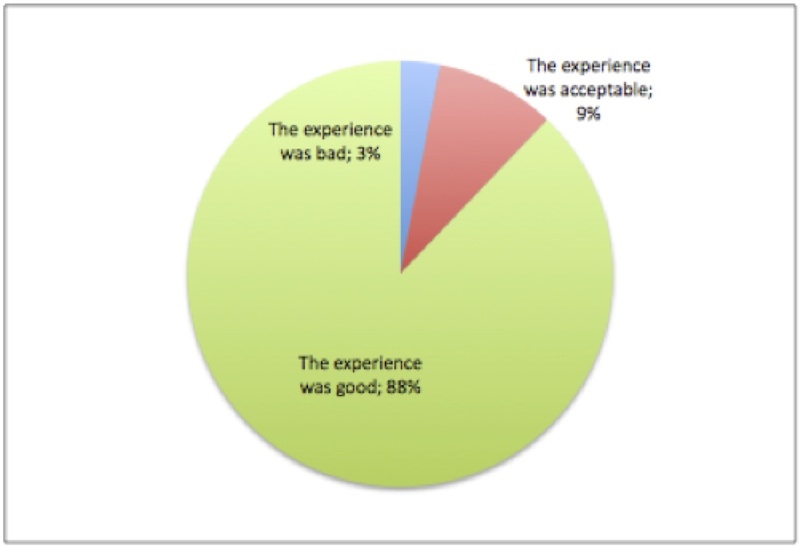 Out of the respondents who had submitted papers that had been rejected, two reported that the experience was “acceptable” and one reported that the experience was “poor”. Unfortunately, the open-ended follow-up question was not completed so we are unable to pinpoint the reason for the responses. There are certainly many limitations associated with this research. As Egbert (2007) pointed out, it is likely that journals should be evaluated using different measures and establishing the appropriate measures might be the first step. Whereas the measures described in this article are helpful, it would have been useful to further expand them to investigate some of the factors in more detail. For example, the notion of diversity was almost exclusively restricted to location for the purposes of this research whereas we know that diversity may encompass many different factors and we look forward to researching how we might get such information in the future. There were few cases where authors did not have a positive experience and it would be useful for the editorial teams to know what the reasons were in order to prevent negative experiences for prospective authors in the future. In addition to attention to these areas, it is worth noting that there were some very positive aspects of the journal. For example, one of the greatest services we have found that we are giving is the “quick turnaround” of innovative information for teachers and researchers. Whereas many journals take may take a year or more to get creative ideas out to their readers, we are doing it in a matter of months. In addition, the publication experience was generally viewed as a positive one whereas this is often viewed as a frustrating process with other journals. Jo Mynard is the founding editor of SiSAL Journal. She is an Associate Professor and the Director of the Self-Access Learning Centre at Kanda University of International Studies in Japan. Her research interests include self-access, affect, advising and motivation. I would like to thank my friend and colleague Tim Murphey for his help with the original research, for his ongoing encouragement, and for helping me to understand the meaning of diversity. I am grateful to my colleague Neil Curry for his invaluable feedback on previous drafts of this paper, and to 85 anonymous respondents who completed our survey. The research was supported with funding from RILS&LE at Kanda University of International Studies. Briskin, A., Erickson, S., Ott, J., & Callanan, T. (2009). The power of collective wisdom and the trap of collective folly. San Francisco, CA: Berrett-Koehler. Egbert, J. (2007). Quality analysis of journals in TESOL and applied linguistics. 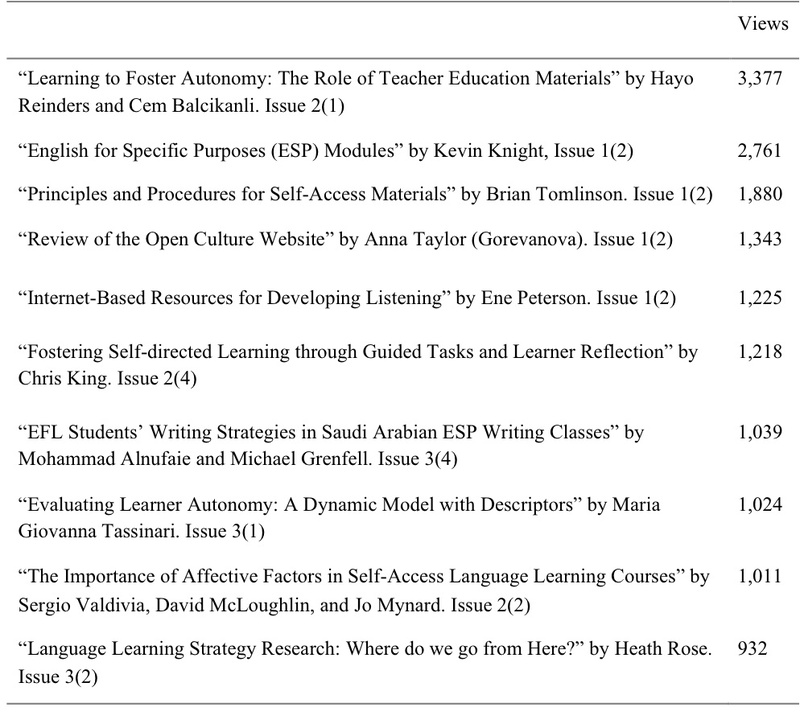 TESOL Quarterly, 41(1), 157- 171. Lugones, M. (2003). Pilgrames/ Peregrinajes: Theorizing coalition against multiple oppressions. New York, NY: Rowman & Littlefield. Murphey, T., Mynard, J., & Shanley, M. (2012). Editorial strategies for stimulating professional collaboration with peer reviewed publications. Studies in Linguistics and Language Teaching, 23, 111-124. Murphey, T., & Mynard, J. (2014). An evaluation of the success of peer-review journals at KUIS. Studies in Linguistics and Language Teaching, 24, 63-92. Ortega, L. (2005). For what and for whom is our research? The ethical as transformative lens in instructed SLA. Modern Language Journal, 89, 427-443. Ortega, L. (2011). SLA after the social turn: Where cognitivism and its alternatives stand. In D. Atkinson (Ed.) Alternative approaches to second language acquisition (pp. 167-180). London, UK: Routledge. Polonksy, M., Jones, G., & Kearsley, M. (1999). Accessibility: An alternative method of ranking marketing journals? Journal of Marketing Education, 21(3), 181-193. 1. We aim to gather input that will help us to improve SiSAL Journal. This anonymous survey is designed to gather views from readers on the quality of SiSAL Journal. We are also gathering feedback from authors on the publication process. The whole survey should take less than 5 minutes to complete. Thank you for your participation. The results will be published in a future issue of SiSAL Journal. 2. How often do you read articles in SiSAL Journal? 3. In general, how would you rate the quality of the journal? 4. How likely are you to cite or refer to SiSAL Journal articles in your work? 6. Have you ever submitted a paper for publication in SiSAL Journal? 7. How would you rate your experience of publishing your paper in SiSAL Journal? 8. How was your experience with submitting a paper that was subsequently rejected? 9. How likely are you to submit a paper for publication in SiSAL Journal in the future? 10. How could SiSAL Journal be improved? 11. Which statement best describes you? Thank you. The results will be published in a future issue of SiSAL Journal. Some suggestions were made which helped add to the clarity of the article, so that it was improved. Really supportive – 3 reviewers and editors really going out of their way. The editorial team is very helpful in giving ideas to improve the article. The reviewers were thorough and tough, but ultimately helped us re-shape our paper to meet SiSAL’s needs and standards. Great system for non native speakers. Appreciation. Supportive reviews which improvd my work. Quick turnaround also good. Helpful comments from the reviewers to improve my article further. I’m not involved in self-access any more. I do not feel that I have enough to say. I am retired from my previous academic job. My colleagues and I have one under review at present. I still have plenty of material from working with Self-access and teaching it as a subject within Applied Linguistics. As a ‘specialist journal’, it would be the most appropriate place to publish. I’m a language advisor trainer. My practice may interest the journal’s readership. Recently presented on a topic related to self access and would like to write it up and be able to share with others in the field. I’m not sure. I like the current format and presentation. I like the different topics that are covered. It is a source of information for me, so there isn’t anything that I can think of that could be improved. I think that the journal is good as it is. I don’t think of anything to improve. It is very good. Contributors need to take more responsibility for the quality of scholarship. Some SiSAL articles seem to be the product of ad hoc analysis, and often the data is not as complete as it ought to be. My fear is that some people take advantage of the fact that a large number of studies in the field of learner autonomy are qualitative and use publications like SiSAL to report anecdotal findings. You can give chances to unknown researchers from developing countries who need self-access learning badly. I think that a few small practical ideas in each issue would be a good idea, or a readers’ forum. I enjoy it very much. I do not have any comment. It would be nice if the studies published could be classified according to what they are. Most seem to be teacher reflections, some are case studies, some are opinions pieces. Having a guidepost would make reading far quicker. I di not care abiut it. I like the themed issues. I also like the fact that it’s open access. No improvements that I can recommend at this time. I think there probably has to be more ‘commissioning’ of articles. By that I mean that there are many people qualified to write and publish, but it is not a requirement within their job description, so they don’t. I think more reviews of particular apps or computer programs or things like dictionaries could be included so that readers are kept up-to-date and reflections n the use of particular facilities like language cafes, caraoke, tandem conversation schemes, and the like, would be useful. Email alerts wehn the journal is published, like Reading in a Foreign Language is twice a year.